Canada's most popular spinner blades. They spin slowly and easily. Perfect for harnesses, spinnerbaits, in-line spinners and many other lures. 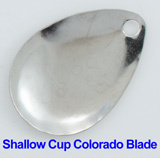 Use Colorado blades to maximize lure vibration and lift.